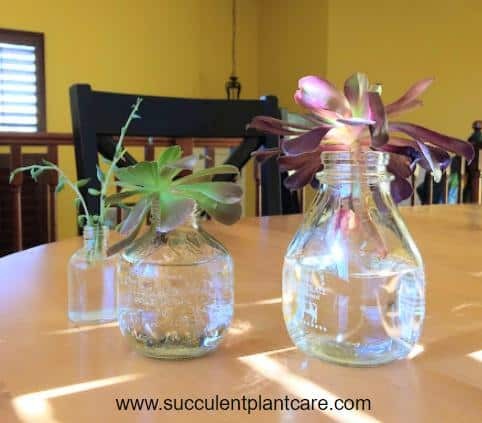 The topic of water therapy for succulents seems to come up quite a bit these days especially in different social media platforms. Pictures of succulent plants with roots submerged in water have been popping up on Pinterest and Instagram. For us succulent growers, we are naturally curious about water therapy and how it works for succulents. Is water therapy good for succulents? What is the purpose of water therapy? Won’t succulents rot in water? You’ll find the answers to these questions plus many more in this article. What is water therapy for? We hear about water therapy for succulents here and there. What is it really? 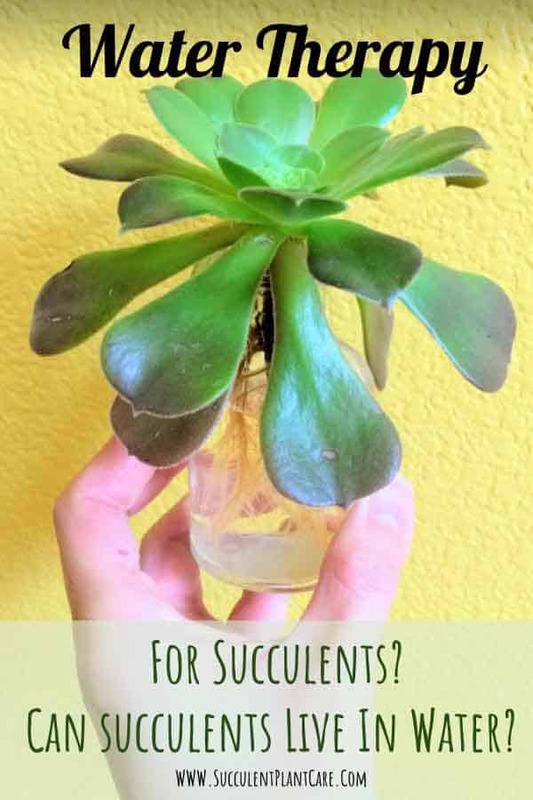 Some people (I say some people because this is not commonly done) like to use water therapy to revive an extremely dehydrated succulent or a stressed out succulent from too much heat and very little water. Some people also use water therapy for plants that have been shipped bare-root and have dried out and become dehydrated from shipping and packaging. These plants are also most likely stressed out from all the handling and transporting. Water therapy is leaving the plant in water anywhere from a few hours to a few weeks, then repotting back in soil. The purpose of water therapy is to revive an extremely dehydrated, stressed out plant. How do you use water therapy for succulents? Remove the dehydrated plant from the pot and remove any of the remaining soil around the roots. You can do this by blasting or spraying the roots with water. Submerge the plant’s roots in water. Try to submerge only the roots and not let the water touch the stem. If the plant you are doing water therapy for is a newly shipped plant that was shipped bare-root, simply dip the plant’s roots in water, letting the roots touch the water so it can absorb it. Some people like to use rainwater that has been collected and stored because rainwater has the right balance of pH that succulents prefer. Rainwater also provides some nutrients that succulents need minus the salt and other minerals present in tap water. If you do not have rainwater available, you can use regular tap water. Distilled or purified water is not necessary. Won’t succulents rot in water? Succulents are susceptible to root rot. The main culprit for root rot is the bacteria in the soil. If the plant is sitting in wet soil constantly, root rot may develop. In theory, succulents sitting in water alone are not prone to root rot because bacterial pathogens present in soil is not present in water. Why not just submerge the whole plant in water? This can definitely be an option. In fact, some people only water their potted succulents this way. It is also called the ‘soak and dry method’. How the soak and dry method works is instead of watering from the tip, the pot is placed in water for a few minutes until the plant has absorbed the water from the root up. Remove the plant from water then repeat the process again when the plant is dry. While this method is an option, not all people have success using this method. There is always the risk of overwatering succulents and causing root rot. Therefore some people tend to underwater, or forget to water their plants. When this happens and they find their plant severely dehydrated, they opt for water therapy to treat their severely dehydrated plants. Will water therapy help sunburned succulents? Sunburned or sun damaged succulents are not necessarily dehydrated. A succulent can get sunburned from too much sun exposure in the summer months or during a heatwave, or a succulent can get sunburned from increased sun exposure. Baby plants or smaller plants are particularly susceptible to sun damage. When a succulent gets sunburned, the leaves or part of the plant get brown or burnt spots. Unfortunately, there is little you can do about these burned spots. Water therapy will not help with these. Majority of the time sunburn on succulents is harmless. You just need to wait for the brown spots to shed or new growth to develop to get rid of them. Or you may choose to carefully pull the burned parts out. Water therapy for sunburned succulents will only work if the plant is also very dehydrated. The plant should plump back up almost immediately, but it won’t get rid of the burned spots. Another controversial topic involving water and succulents is water propagation for succulents. 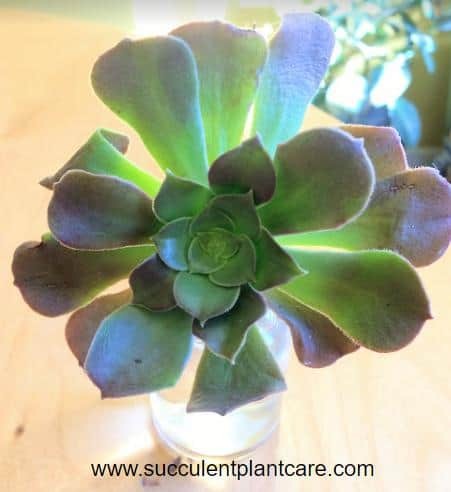 I have written a how-to guide on water propagation for succulents here: “Water Propagation for Succulents: A How-To Guide” and it has been one of our most popular articles in this website. 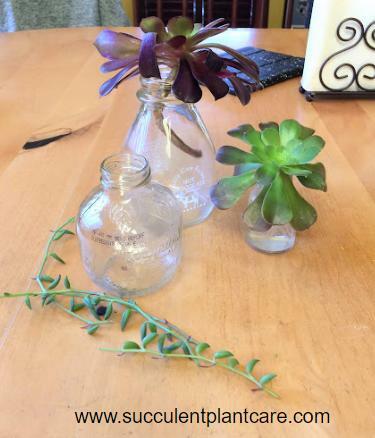 That tells us that people are curious about these methods of using water for succulents. 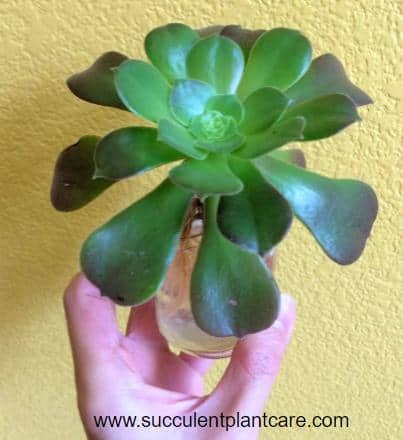 Water propagation for succulents is not the same as water therapy because they have a different purpose. 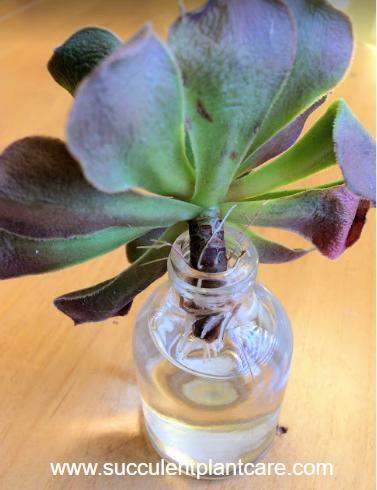 Briefly, water propagation is using water as a medium to root succulent cuttings. After it’s been rooted in water, the plant is usually transplanted back in soil. 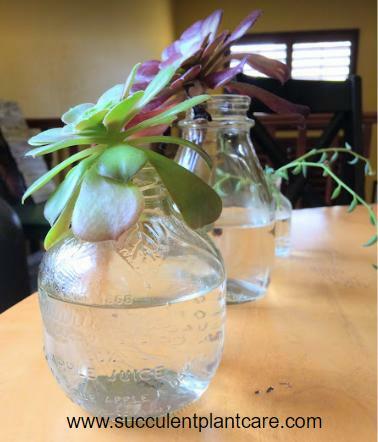 Some people prefer using water propagation as their go-to method in propagating succulents. They find it easier than the dry method of propagation and they have more success with it. 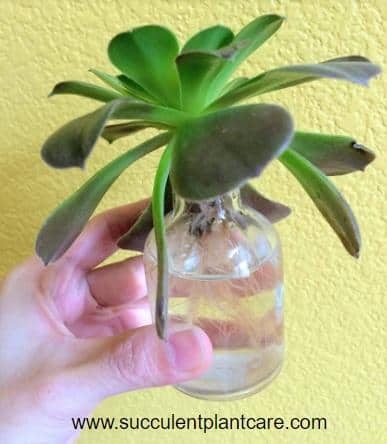 If you are having trouble propagating your succulents and keeping them alive, give water propagation a try. 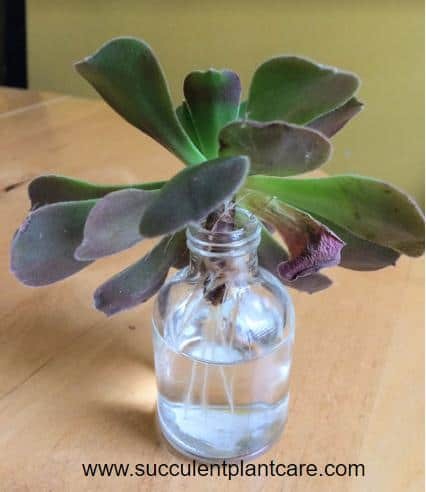 You might be one of those people who has the most luck with water propagation than other propagation techniques. How to root succulents in water? Take a stem or a leaf cutting. Let the cuttings dry for a few days until the cut has healed and sealed or calloused. Place the cuttings just above the water without touching it OR let just the tip of the stem or leaf touch the water. I have tried both and they both work but if you want to decrease the risk of your succulents getting mushy and rotting, try not to let it touch the water. The cuttings will start rooting in about 2 weeks or so, some sooner some later, depending on the type of plant you are using and the environment they are in. Once rooted, you can remove from water and plant the rooted cuttings in soil. Wait about a day or two before planting to let the cuttings dry out a little. After you plant the cuttings in soil, keep in a bright area but away from direct light. Water the cuttings when the soil is dry. 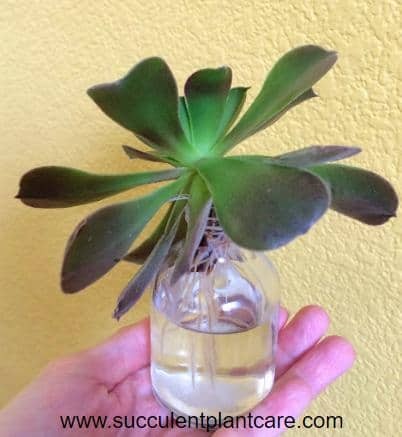 For step by step instructions, visit my post “Water Propagation For Succulents: A How-To Guide”. 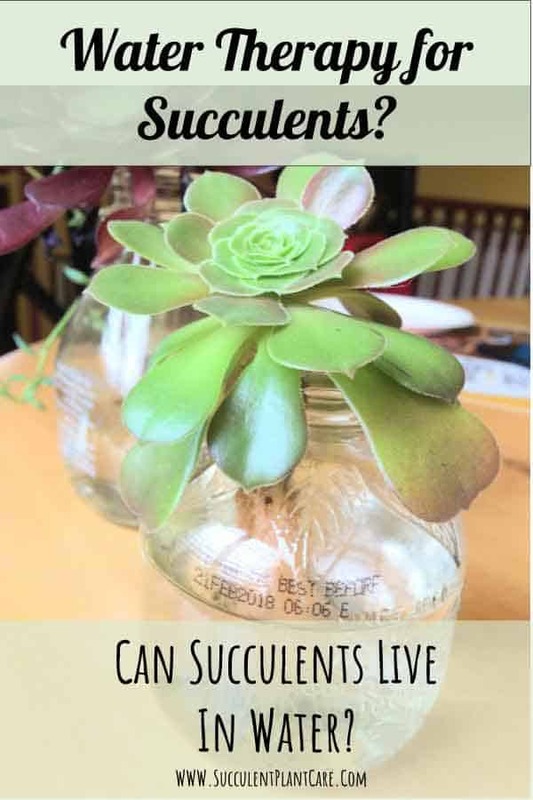 Will succulents survive in soil after being transplanted from water? Yes. While not 100% guaranteed that all of your plants will make it, succulents can survive in soil after rooting in water. I have propagated succulents in water before and have transplanted them back in soil and most of my plants made it and are doing well upto this day. I find stem cuttings, no matter what method (dry or water method), tend to do better than leaf cuttings so if you’re new to this, try stem cuttings first for greater success. Stem cuttings also take faster than leaf cuttings to grow new plants. If you’re using leaf cuttings, it’s better to have a few because not all of them will make it so it’s good to have some extra. 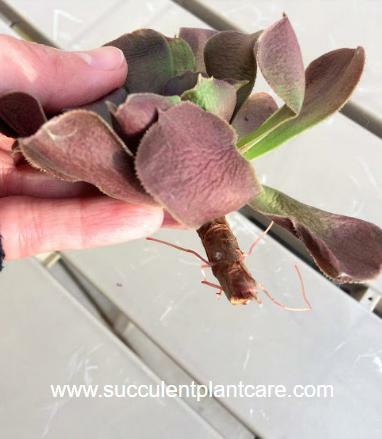 Check out my post “Does Water Propagation Work For Succulents?” to see how water propagation worked for my stem cuttings after being transplanted in soil. Can you grow succulents in water? Apparently some people grow succulents hydroponically. You can check out some YouTube videos of people growing their succulents in water. While interesting, this is clearly not conventional and so there’s not a lot of information available. When grown hydroponically, the plants will eventually need to be fed nutrients that they would otherwise obtain from the soil. A diluted fertilizer treatment applied to the water once a month may be sufficient. I’m assuming some trial and error is needed as there really isn’t that much information about this. I would start with the least amount of fertilizer as succulents are not heavy feeders to begin with. How long can they stay growing hydroponically I cannot tell. I’m assuming they can grow in water indefinitely and as long as they are happily growing, it doesn’t really matter where they’re growing. I found this aeonium (Aeonium ‘blushing beauty’) head on the ground after a particularly stormy and windy night . It had snapped off from the mother plant and to be honest, I have these growing in several pots that I wasn’t too keen on saving it so I left it on the side and kind of forgot about it. A few weeks later I noticed that it was shooting out little roots. It was also severely dehydrated by that time (please refer to pictures below). I didn’t have the heart to discard it and so I thought I’d do a little experiment and see how this water therapy works. The little guy perked up within a few days of soaking in water. And after about a week have grown plenty of new roots. 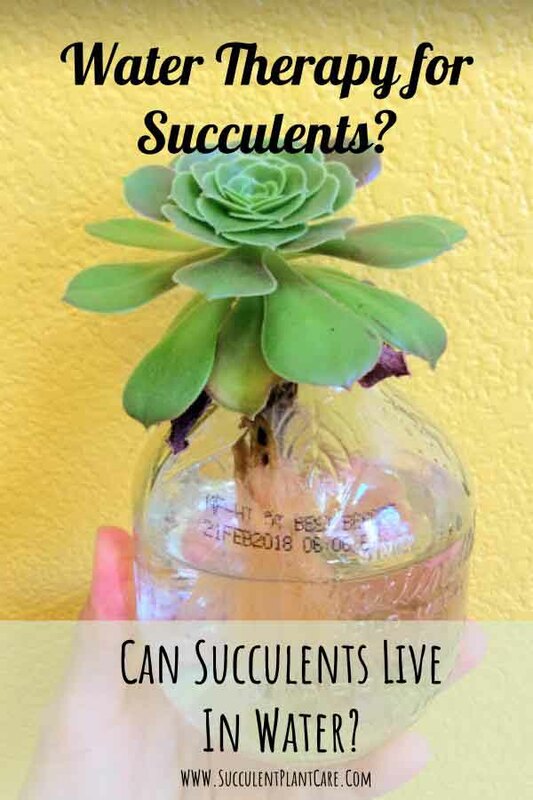 Once you notice the succulent looking plumped and replenished, usually within a few days to a week depending on the type of plant and the severity of dehydration, you can take it out of the water. Wait about a day or two and repot it in a well draining potting mix. You don’t have to water right away because the plant is still saturated with water. 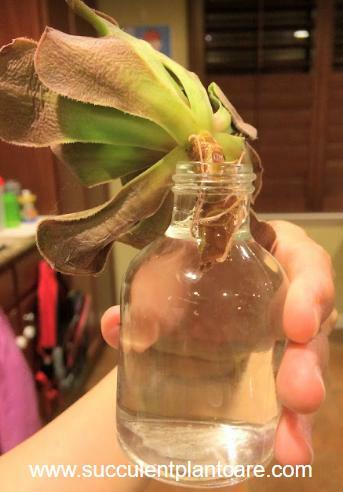 And that’s how you can use water therapy to revive a severely dehydrated plant. 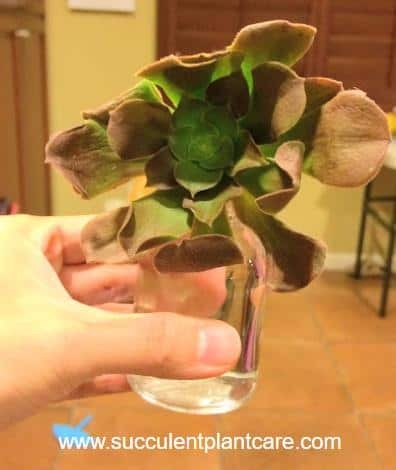 Severely dehydrated aeonium head that broke off from the mother plant. It was shooting out roots seeking moisture. It was a good candidate for water therapy so I placed it in water. It looked severely dehydrated and wrinkled. Less than a week later, it grew more roots. About a week later, the plant has perked up quite nicely and is no longer wrinkled. The roots got a lot longer and has grown more roots. At this point, the plant can be taken out of water. The purpose of water therapy is to rehydrate the plant and replant it back in soil. About two weeks in, the plant is still looking good and growing lots of roots. I decided to keep it in water even though water therapy is technically over. I wanted to see how long it can live in water. Another two weeks or so, the plant has grown more roots and still looked good. Instead of transplanting my plant in soil, I decided to continue with the ‘experiment’ and keep it growing in water. I also liked how these fresh succulents looked in my house, on my dining table so I added another aeonium head (this one is an Aeonium arboreum ‘zwartkop’ or Black Rose aeonium) that had also broken off after another stormy night and a few String of Bananas ‘Senecio Radicans’ stem cuttings. This could be a new thing for me in my house. Instead of fresh flowers in vases, I’ll have fresh succulent cuttings instead. Anyways, I wanted to see how long these succulents can live in water and if they will actually start producing new growth–meaning new leaves from the top and not just roots. So far, all of them are doing ok in water and looking quite healthy and happy. This first aeonium, however, is starting to look paler than normal. We’ve had a lot of cloudy days here and it’s been raining a lot so I think it’s not getting enough light indoors. But now that rainy days are over we’ve been getting plenty of sun so I think it’ll be ok. I might even transfer it outside and see how it goes. For now it looks ok and still healthy, three months in. The minute I sense that the plant is suffering I will remove it from water and repot in soil, I promise. In the meantime, I’ll keep the others growing in water as well. I’ve only replaced the water a couple of times and have used tap water. I have not added any nutrients in the water. Here’s how it looks 3 months later with the roots still soaking in water. I moved it to a bigger pot and replaced the water a couple of times but that’s about it. This article has covered a lot of the basic questions people have about water therapy, water propagation, and growing succulents hydroponically. If you are looking for a different, less conventional way of growing or treating your succulents, you can give water a try. If anything, it is really neat to see succulent roots growing in water. Water therapy and water propagation may not be for everyone. I have a lot of cuttings to spare so I can afford to play around and see what happens with them. Also, I have tried this in the past and know how to keep them alive in different situations. If you are new to growing succulents or if you’re just starting your collection, you may want to reserve these ‘experiments’ for later on. 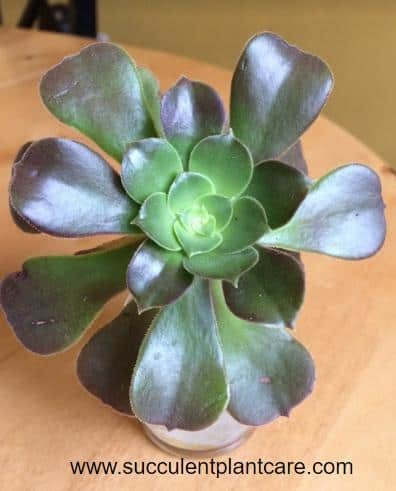 How To Tell If Your Succulent Is Over or UnderWatered? 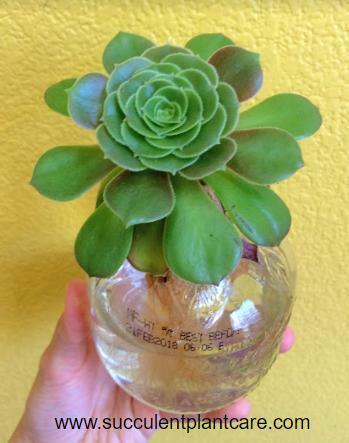 How To Save An Over Watered Succulent? Save this by Pinning it to your board now! Wondering where to buy succulents online at a reasonable price? Click on my resource page for recommendations.